Cream City Foundation Records, 1982-2001. UWM Manuscript Collection 205. Archives Department. Cream City Foundation (CCF) is the only non-profit, grant making, community-based foundation serving the entire State of Wisconsin whose sole purpose is to support the changing needs of the gay, lesbian, bisexual and transgender communities. In addition to awarding grants, CCF has also sponsored the Milwaukee Gay/Lesbian Cable Network, a volunteer group that produced regular and special programming on gay and lesbian issues for Milwaukee's public access cable channel. It helped establish the Foundation Community Center in 1988 as a gathering place for various groups in Milwaukee's LGBT community. View finding aid. Sherman Park Rainbow Association Records, 1993-2002. UWM Manuscript Collection 214. Archives Department.Formed in 1993, the Sherman Park Rainbow Association (SPRA) was the first LGBT neighborhood organization in Wisconsin. It existed primarily to provide a social network for gays and lesbians living in this West Side Milwaukee neighborhood, although it occasionally became involved in civil rights issues. SPRA held monthly meetings and social events such as picnics, potlucks, and holiday parties. The group worked with other local LGBT organizations, including PrideFest, the AIDS Resource Center of Wisconsin, and the Domestic Partnership Task Force. SPRA also collaborated with its mainstream counterpart, the Sherman Park Community Association (SPCA). SPRA members sat on the SPCA Board of Directors, provided leadership for the Neighborhood Watch and the Neighborhood Housing Survey, and volunteered for ShermanFest. Black and White Men Together-Milwaukee Records, 1981-1991. UWM Manuscript Collection 208. Archives Department. PrideFest Records, 1989-2001. UWM Manuscript Collection 315. Archives Department. Milwaukee's first Pride event occured when the Gay Liberation Front (GLF) organized a "Gay Pride Week" in January 1971. The event was repeated in 1972 and 1973. 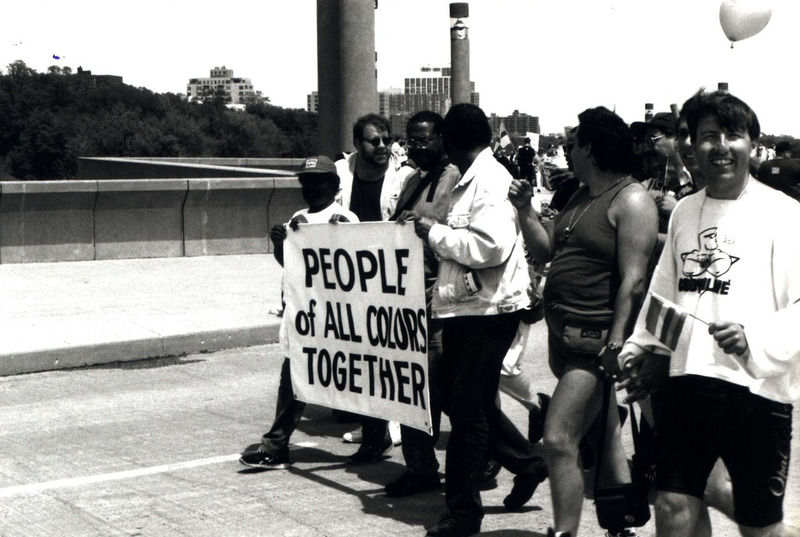 While there were sporadic "gay days" and picnics in the late 1970s and 1980s, Milwaukeeans typically traveled to Chicago to observe or march in that city's celebrations. However, Pride events were held in Milwaukee in both 1980 and 1981. The Milwaukee Lesbian/Gay Pride Committee (MLGPC) held its first annual pride event in 1988. In 1994 MLGPC was dissolved and PrideFest, Inc. was created. PrideFest has been held at various locations during its history, including Mitchell Park (1988), Cathedral Square Park (1989-1990), Juneau Park (1991-1993), Veterans Park (1994-1995), and the Henry Maier Festival Park (since 1996). The festival features a diverse range of performers and numerous activities such as a volleyball tournament, parade, religious ceremony, mass wedding/commitment ceremony, and fireworks. View finding aid. SAGE Milwaukee Records, 1992-2012. UWM Manuscript Collection 329. Archives Department. SAGE Milwaukee was established in December 1993 as an extension of the national SAGE network. Eldon Murray, a well-known and award-winning LGBT activist, was one of the founders of the organization. SAGE Milwaukee focuses on developing events, programming, and socials meant to improve the quality of life for senior members of the southeastern Wisconsin LGBT community.View finding aid. Cream City Business Association Records, 1979-1989. UWM Manuscript Collection 204. Archives Department. Collection consists of the records of the Cream City Business Association, an affiliation of metropolitan Milwaukee gay and lesbian business owners and service providers that was in existence from 1981 to 1989. Collection includes meeting agendas and minutes of the executive committee and board of directors, newsletters, administrative correspondence, business directories, and committee files. View finding aid. Milwaukee Gay/Lesbian Cable Network Records, 1987-1994. UWM Manuscript Collection 206. Archives Department. The Milwaukee Gay/Lesbian Cable Network (MGLCN) was a volunteer group that produced regular and special programming on gay and lesbian issues for Milwaukee's public access cable channel. In May 1987, MGLCN approached the Cream City Foundation (CCF) with a request for $400 to finance the premier episode of its first regular program, Tri-Cable Tonight. The show was described as "cable television series exploring the color and diversity of Milwaukee's Gay and Lesbian Community." Tri-Cable Tonight addressed a diverse array of topics related to the Lesbian and Gay Community. More information on topics covered can be found in the collection's finding aid (which includes links to the Tri-Cable Tonight Digital Collection). Oral History Interviews of the Milwaukee LGBT History Project, 2003-2007. UWM Manuscript Collection 200. Archives Department. Joseph Pabst Papers, 2002-2013. UWM Manuscript Collection 292. Archives Department. This collection documents Joseph Pabst's philanthropic support of numerous organizations, mostly LGBT-related, in Milwaukee, Wisconsin. The collection includes correspondence, donation information, photographs, and information about the organizations that Pabst supported. View finding aid.